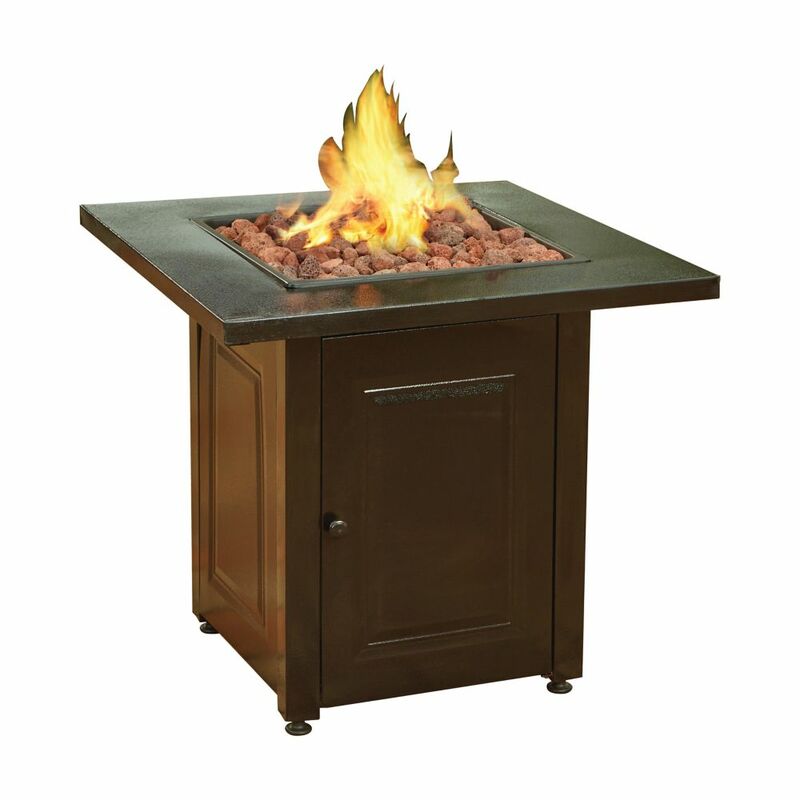 Give your outdoor dicor a makeover with the Square shaped fire table. This sleek and stylish propane unit is constructed of a cast aluminium body and table with a powder coated finish in hammered gold (Bronze)colour that will match various colours and types of outdoor furniture. This unit is sure to heat your outdoor space making anytime of year comfortable. Square Propane Fire Pit Give your outdoor dicor a makeover with the Square shaped fire table. This sleek and stylish propane unit is constructed of a cast aluminium body and table with a powder coated finish in hammered gold (Bronze)colour that will match various colours and types of outdoor furniture. This unit is sure to heat your outdoor space making anytime of year comfortable. Square Propane Fire Pit is rated 4.2 out of 5 by 10. Rated 4 out of 5 by Cara from Very nice! This fire pit works good. Easy to set up. The colour is a darker brown, almost black, which I like better. I found it about $80.00 cheaper on another website and Home Depot matched and beat the price by 10%. I gave it 4 stars because it does not come with a cover. Rated 2 out of 5 by twins from NOT as described! This item was described as bronzed metal and came as jet black. Totally disappointed! Rated 5 out of 5 by Darcia from Great Firepit. Warm and easy to light. Comes Tully ready to insert full size gas tank, light and enjoy. Great value. We love it. Rated 4 out of 5 by Bubba from Nice The instructions for putting it together could have been better written. It take two people to assemble. Buy some glass stones 20 lbs. use a plastic sheet with clamps to protect it from the rain. Works well. Lighting it takes getting used to. Rated 4 out of 5 by bakerc3 from Pleased Overall This came in the wrong colour, but turned out to be better than the colour we ordered. Disappointed that it didn’t come with a cover. Perfect size for our small deck. Can this be used in a sheltered place like 24ft x 15ft. carport that is closed on both sides but open on the ends. It uses a 20lb tank and the tank does not fit inside all models. Does it come with a cover? If no, can we buy one? We do not sell covers. This unit is meant for propane fuel only. Altering the fuel source in any manner would void the warranty. This unit does not come with a cover. Is the flame on the pit adjustable, does it use the large 20lbs propane tanks and does the door on the unit open to store the tank underneath, thanks ahead? Since I didn't receive any answers to my earlier questions, I decided to call Home Depot Customer Service, she answered that indeed the unit hooks up to a 20lbs propane tank and the tank stores nicely underneath. As for the adjustable flame - she was unsure and gave me the number to the manufacturer. When contacting the manufacturer (nice folks, very helpful) yes indeed, the flame is adjustable and they reconfirmed that it hooks up to a 20lbs propane tank and it can be stored underneath. Cheers, David L.